Basic overview of coral bleaching supported by downloadable fact sheets on coral bleaching. Its most powerful message is within its data graphics of coral bleaching locations around the globe. Concise, to-the-point, general overview to coral bleaching. Global graphics that show scale of bleaching throughout the oceans is powerful. 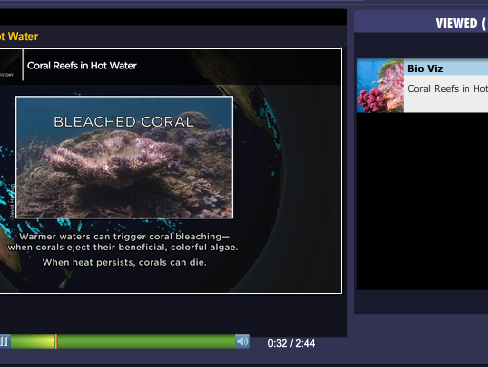 Short video shows relationship between warmer oceans and coral reef health and heat stress. Comments from expert scientist: This is not an activity, but it is a very well-put together visualization about coral bleaching. The mapping is wonderful. Knowing what coral bleaching is prior to watching video might be helpful as video only gives a brief, concise definition. Background fact sheets are provided as well as downloadable video webinar. There are display options to show video in other museums or informal science centers. Video and supporting materials could potentially comprise an entire unit for an educator. A short transcript goes along with the video. Technical computerized imagery is good. The visualizations make the impact of coral bleaching very easy to see on a global scale. Well-organized supplementary materials and multimedia resources.